February 2008 – Christian Gossett’s THE RED STAR™ on sale here. This is a favorite of mine, as proved by the fact that I really do not have much artwork from my young days. For those of you brilliant people who were among the early adapters to Roleplaying Games, the reminiscence that follows below won’t seem overly geeky. I drew this when I was 16 years old. Anyway, the support spells were built into the armor. 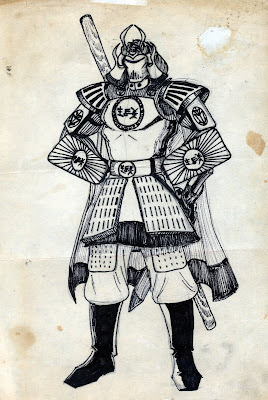 There were five gems adorning it (those round areas with the Katagana on the gauntlets, belt, chest and helmet.) Each gem cast an attack spell when saying a command word. For those of you ubergenre classicists, you’ll be able to recognize EXACTLY what piece of cult movie history those particular Japanese letters are taken from. The big hint is on the upper-arm plates. Yes, the character under all that armor was based on a certain role played by the great Peter Weller from a movie in the mid-80’s that I ABSOLUTELY LOVED. I decided that this character’s ability to dimensionally travel (oh no, I’m not saying his name. You brilliant people can take these clues to google and figure it out. 🙂 sent him hurtling through a rift and into the fabled lands of Greyhawk. Which is where Dean’s campaign was based. To celebrate this new level of power, this drawing was made. That little portrait box on the character sheet just didn’t cut it!